This is for ONE Flexishield. Please order two if you have a double breastpump. 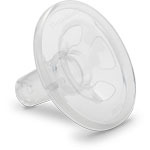 Flexible silicone flange insert massages the areola to help stimulate let-down, thereby increasing milk flow and volume. May also be used as a reducing insert.